As you know, OnePageCRM allows users to create contacts with the same/similar data. However, in some cases this means unwelcome duplicates are created. So in the hopes of resolving this issue once and for all, today we launch the simple but amazingly effective feature – merging duplicates (triplicates as well!). Now, with just a few clicks you can merge 2 or even 3 contacts. How does the Merge Duplicate tool work? After you select Merge Duplicates from the Bulk Action menu dropdown, you will be able to edit merged contact’s data and then save it as single contact. All Next Actions you had with merged contacts will be preserved and converted into Queued Actions. In addition to this, you are now able to export selected contacts from within the same Bulk Actions Menu. Just select contacts in your Action Stream and click Quick Export. A .CSV file with the selected contacts, will be immediately saved to your hard drive. Note that this option is only visible for users with export permissions. The merge feature is going to be so helpful Greg. This is a really useful tool. Will it also merge Email, notes, deals etc? Hi Robin, yes it merges all the data! You’re welcome – and stay tuned – more great things will be revealed soon! Hi Greg, For the system to work really great for my mobile sales people, the need to be able to query contact by area. IE they need to see what contact are near to them when they are in a particular area. The need to be able to do this on an I phone or I Pad ?? Hi Eddie, this is possible on your desktop not yet on mobile – we are working on this – basically you will be able to use Advanced Search feature to find all customers from selected City, State/County or Zip Code (they are coming to Ireland;). We are also thinking about geolocation feature but this will be introduced later next year. Is there a way to first identify duplicate contacts? 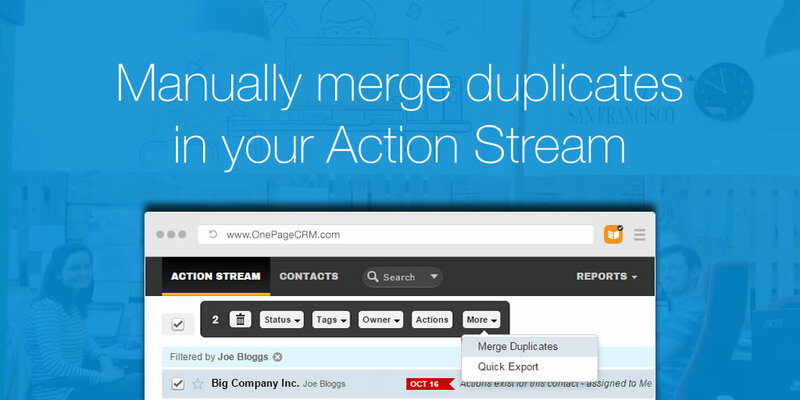 The tips above show how to merge once duplicates are found, but how do you first find them?